This dark blue fully lined jacket is 50% polyester and 50% acetate and is by Halston Lifestyle. 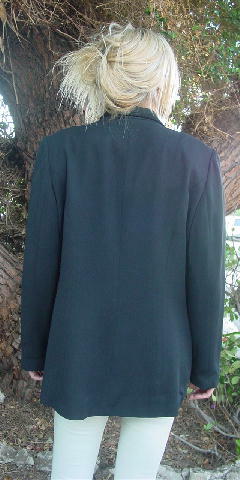 It has shoulder pads, long sleeves, long lapels, and a one button closure. There are two lower flap pockets which are still sewn shut. Around the outer edge of the collar is a 3/8" wide panel which has a soft flat surface. The tag says size 16, but it fits more like a large. She now takes a larger size. She said she bought it in the late 1990s. shoulder pad to shoulder pad 18 1/4"
shoulder to end of sleeve 25"
bottom hem side to side 24 1/2"